Stay up to date! Here we post occasional newsletters that can include notable news, information, opinions and event re-caps. Read everything we know. Hot rods will be rolling in for the High Rollin' Hot Rods Car Show at the Quinault Resort and Casino (QBRC). Join in the fun Friday and Saturday, April 26 and 27. Owners and enthusiasts will take in the cars, games and prizes at QBRC. For this 10th annual show, it all goes on rain or shine. Event goers will also have an opportunity to meet Lance Lambert from the Vintage Vehicle Show. Lambert has seen it all as the host on the show, taking viewers to see everything from the biggest and best car shows in the United States, to museums and private collections owned by celebrities. The Push Rods of Hoquiam Car Club was originally founded in 1953, by an area group of friends. The group raises money to provide two college scholarships for Grays Harbor College, assisting motivated students studying the auto and business industries. The also donate to the Aberdeen High School Auto Shop, The Meals On Wheels Program and the Center for Domestic Violence. There will be cash and prizes galore throughout the event with $3,000 being given away. Enter the Poker Run 1-4 pm, Friday. Bring Your ‘Rod! Pre-register a car for the show for $15 or $20 on arrival for the show. Registrants will receive a goodie bag, dash plaque and entry in door prizes drawn every 15 minutes. Check-in for the show begins around 8 am with the shows concluding between 2-3 pm. 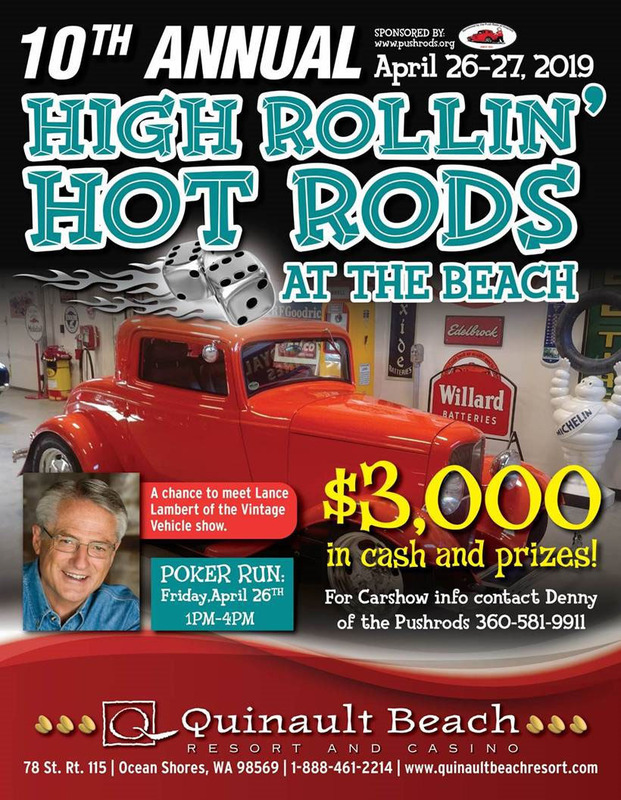 For more information on the High Rollin’ Hot Rods event or to register, visit the Pushrods of Hoquiam official website, the Pushrods of Hoquiam Facebook page, or contact Denny of the Pushrods at 360-581-9911. 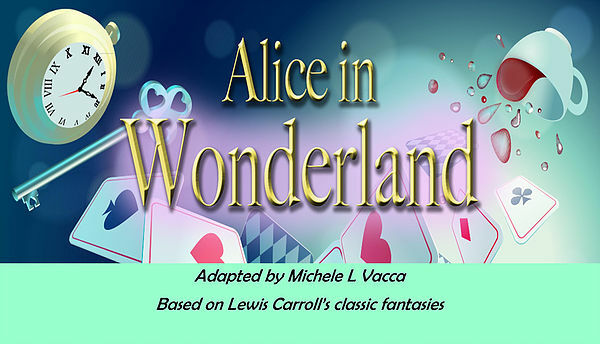 Stage West Community Theatre is proud to present "Alice in Wonderland." This is based on one of the more widely beloved British children’s books, "Alice’s Adventures in Wonderland" by Lewis Carroll. Follow Alice as she has many wondrous, often bizarre adventures with thoroughly illogical and very strange creatures. She encounters the hookah-smoking Caterpillar, the Duchess (with a baby that is a pig), and the Cheshire Cat. Alice attends a strange endless tea party with the Mad Hatter and the March Hare. She plays a game of croquet with the Queen who calls for the execution of almost everyone present. With its fantastical tales and riddles, this is a fast paced, colorful, witty, and a delightful visit in Wonderland. The script is full of humor, fun and action. The whimsy, energy and creativity of the show will take you on a journey of childhood discovery. Stage West has been providing quality live theater to the North Beach community for over seven years and continues to be the only community organization dedicated solely to keeping local theater alive. We have volunteer opportunities for actors, musicians, directors, set creators, stage managers, web and social media promotion and performance help for all ages and experience. Tickets are $10, $5 for students. Performances are 7 pm, Fridays and Saturdays and 2 pm, Sundays, May 3,4,5 and 10,11,12. Performances are at the Lions' Club in Ocean Shores. Purchase online:Stagewestcommunitytheatre.org. 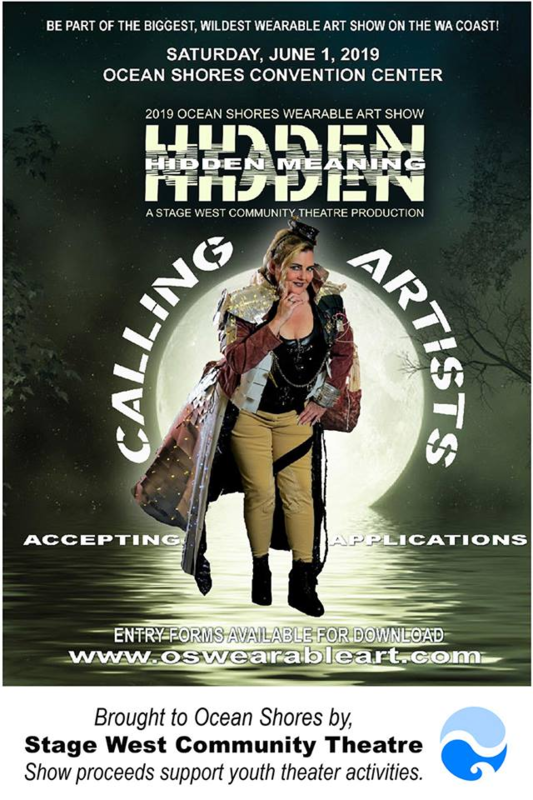 Ocean Shores Wearable Art Show Is Looking for Artists! The Ocean Shores Wearable Art Show is gearing up for their eighth crazy runway show! Artists are busy working on their creations and set designs are being planned. While I’m a bit biased, I think this show has become a local favorite among the many great events happening in Ocean Shores. Show producers, Eric Bjella and Tricia Funk, have always intended that the show, once it proved its value, be used as a fundraiser to benefit a local non-profit willing to take on the production responsibilities. Stage West Community Theatre (SWCT) has been a non-profit community theatre producing plays in Ocean Shores for nearly 10 years. The theme for the 2019 Show is: “Hidden Meaning” and artists are encouraged but not required to create pieces along this theme. Artists of all media are invited to create ensembles of functional and not so functional pieces of “clothing” and accessories to be presented in a one-of-a-kind runway fashion show held at the Ocean Shores Convention Center on June 1. This is a runway extravaganza with something to pique your creative interests. The show is rated PG-13 and well-behaved children accompanied by an adult are welcome. There will be a no-host bar available. Doors open at 6:30pm and show starts at 7:30pm. 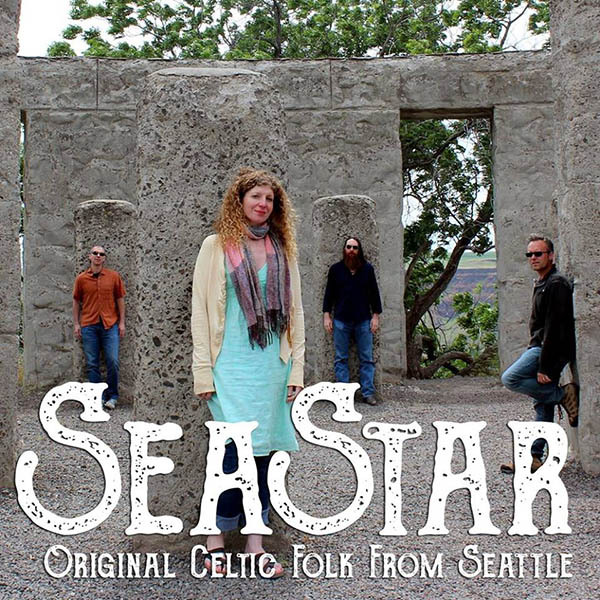 Tickets will go on sale May 1 and will be available online at the Stage West Community Theatre website or at The Dusty Trunk store in Ocean Shores. "Rockin' the Shores" takes center stage as the fourth annual benefit for Ocean Shores Food Bank. Back by popular demand is “RAUCOUS”. This band presents an energy-packed, audience-friendly performance playing a variety of classic rock and dance music. "RAUCOUS" has performed at clubs, casinos, dances, festivals, fairs and various events throughout the Pacific Northwest. "RAUCOUS" has been selected to perform multiple times at the Bite of Seattle and the Taste of Tacoma. The evening begins with a silent auction 4:30-6 pm with along with music by Charlie Baer. 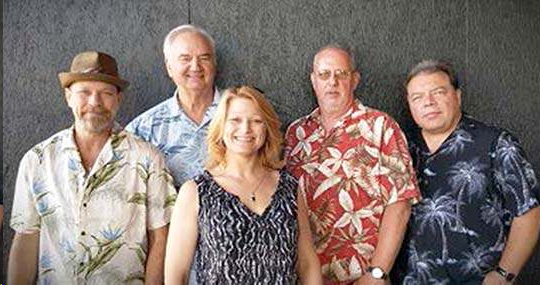 Dinner by George Lee is at 6 pm, then it’s time to rock out with "RAUCOUS" starting at 7 pm. Live Auction takes place at 7:30 pm, then more music closing out the event at 8:30 pm. Tickets are $35 per person, Reserved table for 8/ $300. Tickets are available at the Visitor’s Information Center (across from Ocean Shores IGA) and at the Convention Center Mon-Fri 10 am-2 pm. You may also purchase online. This is the Food Bank’s only fund raising event during the year. Tickets are limited to 400 and have sold out each year before the event. Here are a few facts about the Ocean Shores Food Bank from 2018. They served 5,094 households, 13,520 individuals and distributed 114 tons of food. Volunteers clocked in 10,852 hours of their time. One of those volunteers, Kathy Harris, a volunteer commented during the first quarter of this year, Ocean Shores Food Bank has seen a 23% increase in the number of guests coming to the food bank compared to last year's numbers. "There is hope and that hope is YOU", according to Sandy Harley, executive director of Ocean Shores Food Bank. "Your support will help provide individuals and families with warm, nutritious food - meals that also offer happiness and hope for a better tomorrow. Everyone can make a difference in the lives of others." Hunger is a year round problem. It’s as much a problem for the working class as it is for those struggling with poverty Life may change for anyone at any time, making the everyday task of providing for one’s family very difficult. The need is present in individuals, families, senior citizens on fixed incomes, the underemployed and the unemployed, those who struggle to make ends meet. For more information, please go to the Ocean Shores Food Bank website:https://oceanshoresfoodbank.org/. The UFO/Paranormal Summit is an annual research conference in Grays Harbor Washington. It is at the Quinault Beach Resort & Casino in Ocean Shores. We feature the world's most renowned researchers in the UFO and Paranormal worlds as well as new researchers as they present their evidence, theories and information. Please note: Sunday workshops are a pre-register event and are limited to 45 guests in total. If you are interested in attending the workshops on Sunday, please let us know. Schedule and speaker lineup subject to change without notice. Throughout the resort grounds, you will find various UFO & paranormal related vendors selling books, t-shirt, trinkets and keepsakes. Get close and personal with the events speakers. Ask the questions you want to ask, get autographs, take pictures and mingle with the leaders in this type of research. The UFOiTEAM is a highly educated group of experienced Paranormal Field-Investigators, who travel by train, bus and local ride-sharing services, to investigate UFO, Bigfoot, Ghost and other Paranormal sighting reports around the world. Come share your experience! Witnesses are given the opportunity to tell us what they saw, what happened and the circumstances surrounding their sighting or abduction in an accepting environment, free of judgement. Maurene Morgan is a Washington State Mutual UFO Network (MUFON) State Section Director and Certified Field Investigator. She has investigated dozens of reports of UFOs, entities and mental and physical procedures. We will have great lunch specials available at the Summit. The Quinault Beach Resort & Casino provides fun wraps, sandwiches and snacks at the event or feel free to wander over to the Bistro for more options. Based on declassified FBI documents, "The Maury Island Incident" tells the incredible, tragic, and forgotten story of Harold Dahl, who on June 21, 1947, alleged a UFO sighting over Puget Sound, WA, sparking 'the summer of the saucers,' the modern era of UFO obsession, the first appearance of 'Men in Black' and a governmental battle over UFO sighting jurisdiction reaching directly to FBI Executive Director J. Edgar Hoover. Jonathan Dover spent 31 years as a law enforcement officer. He worked in the Arizona Police Department, The National Park Service, Navajo Historic Preservation Department, and the Navajo Nation Rangers. Derrel Sims, The Alien Hunter. The world’s leading expert on alien abductions. His 38+ years of field research has focused on physical evidence, and led to his groundbreaking discoveries of alien implants and alien fluorescence. As a former military police officer and CIA operative, Sims has a unique insight to the alien organization which he believes functions similarly to an intelligence agency. Please note: In order to attend Sunday workshops, you need to pre-register via online. Tickets are only $100 and INCLUDE entry for Friday & Saturday. Derrel Sims The Alien Hunter is the world's leading expert on alien abductions. His 38+ years of field research has focused on physical evidence, and led to his groundbreaking discoveries of alien implants and alien fluorescence. As a former military police officer and CIA operative, Sims has a unique insight to the alien organization which he believes functions similarly to an intelligence agency. Sims is also a compassionate and skilled therapist who has helped hundreds of alien experiencers all over the world come to terms with what they've witnessed. He currently works as a licensed private investigator in Houston, Texas. The UFOiTEAM is a highly educated group of experienced Paranormal Field-Investigators, who travel by train, bus and local ride-sharing services, to investigate UFO, Bigfoot, Ghost and other Paranormal sighting reports around the world. Using their extensive expertise and a wide range of experience to uncover ‘Whatever Truth there is Out There,” the UFOiTeam is on a quest to ‘Red-Pill’ the public on the topic of “UFO/Paranormal Disclosure” and the new “Paradigm Shift in Consciousness” that is currently sweeping the planet. The UFOiTEAM’s founding director is Michael W. Hall, J.D., an attorney and former Superior Court Judge Pro Tem with a lifelong interest in UFOs, Bigfoot and the Paranormal. An ‘Experiencer’ himself, Hall has served as a field investigator for the “Aerial Phenomena Research Organization” (APRO), during the 1970s, the legal advisor for the “National UFO Reporting Center” (NUFORC), 1995 to present, legal counsel and research associate for the “National Aviation Reporting Center on Anomalous Phenomena” (NARCAP), since 1999, and a consultant/investigator for the “Mutual UFO Network” (MUFON), since 1995. Michael has also served as the attorney of record for such World-renowned ufologists as Peter Davenport, Dr. Richard Haines and Dr. James Harder. For more information on the conference, please call 888 461-2214. The 32nd annual Beachcombers Fun Fair brings together all kinds of information, experts and enthusiasts for a weekend for anyone who enjoys the beach. 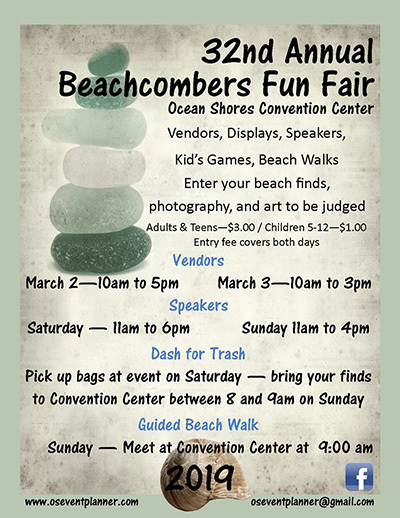 Hours are 10-5 pm, Saturday, March 2 and 10 am-4 pm, Sunday, March 3 at the Ocean Shores Convention Center. Admission, covering both days, is $3 for adults, $1 for children ages 5 to 12, and free for under 5. In addition to speakers, displays, hands-on educational activities and beach-related vendors, you are offered an opportunity to display some of your beach finds and creative talents. Kids games and beach walks are part of the weekend. Several hundred entries in more than 40 categories will be on display. These may include single objects, collections and photography, along with various creative and artistic efforts, such as collages, carvings, mobiles, mosaics, flower arrangements, home décor and furnishings. Entries are to be received at the venue 2-7 pm, Friday, March 1. Entry forms may be picked up and completed on-site. All entries must be retrieved just after the event closes, 4-5 pm, Sunday. There is no charge to enter any display categories. Entrants are competing for ribbons and Best of Show and People’s Choice awards. 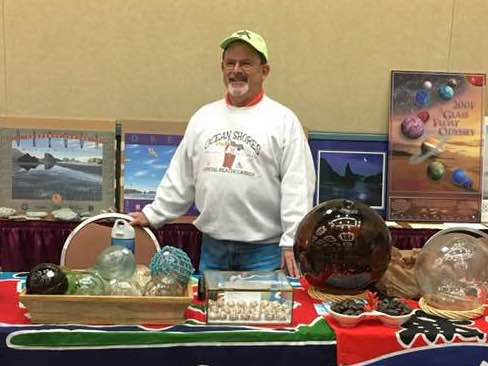 In addition to an array of informational and educational booths, displays and kids’ activities both days, four beachcombing experts are on hand for Saturday afternoon seminars. Sunday morning, Alan Rammer will conduct his annual educational beach walk. Space is limited and people with sign up Saturday. Meet at 9am on Sunday for the walk. At the same time, folks can pick up free trash bags for the other Sunday morning activity, “Dash for Trash and Treasure.” From 9-11 am, people may bring their freshly found items from the beach to tables set up just outside the Convention Center to learn more about their origins. More information is available on the festival’s Facebook event page. The Ocean Shores Razor Clam and Seafood Festival is the celebration of local beach life, culture and the great bounty of the sea featuring our famous razor clam “digs.” The Festival offers activities for the entire family whether you come to go clamming, to enjoy the 6 miles of beach or the amazing array of fun and activities put on by the beach town businesses and Festival. The Festival is growing and expanding this year – check our website, grab a program or just start looking around as you come into town! There will be live music, clamming tutorials, cooking demonstrations, vendors, razor clam art, beer and wine tasting, and a 5K run. For the kids, there'll be face painting and ride the shark. 9pm – More Live Music at the Quinault Beach Resort & Casino! 10am – 3pm – Giant slide ride! FREE Admission for this 13th annual event! Ocean Shores North Beach Chamber of Commerce presents this festival. The Museum of the North Beach will be hosting the next Beachcombing ID from A to Z event on Sunday, February 24 from 2-4pm. Bring in your unique, mysterious or everyday beachcombed objects and local expert and professional beachcomber Alan Rammer will be on hand to identify and educate. Fun is a key element in the program developed by Rammer. He says that finding items on the beach can be enjoyable, and he tries to help participants try to figure out what the items are, where they originated and what the findings could mean. Alan was one of the original founders of the annual Beachcombers Fun Fair in Ocean Shores. A prize will be awarded to the most unique beachcombed find. This is a free event. The Museum of the North Beach is located at 4658 SR 109 in Moclips. We are open 11am to 4pm on weekends during the winter months. For information call us at 360-276-4441 or email kelly@moclips.org. This event includes six walks and a bike, as well as two YREs, in and around Ocean Shores, WA. Also featured on Saturday, February 16, is a dinner and social time in the evening. 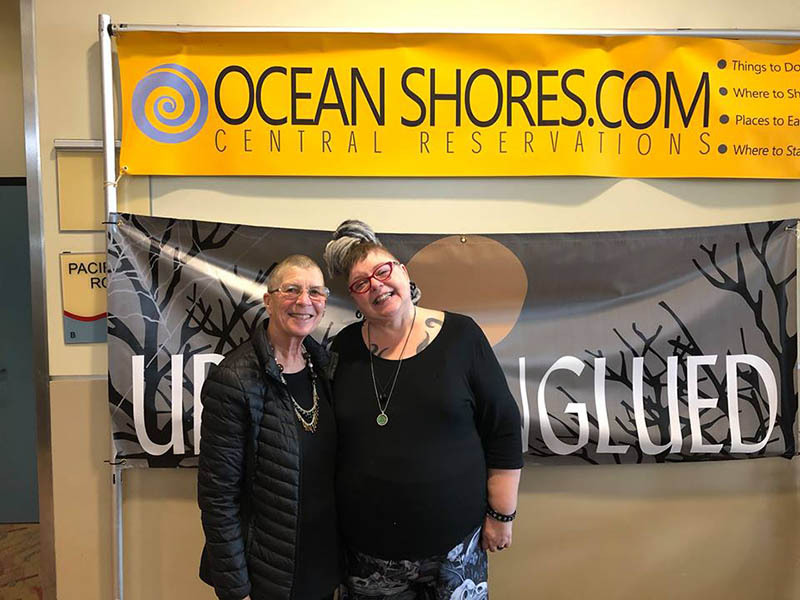 Event: 2019 Seabreeze Walking Festival at Ocean Shores, WA. Sponsors and Dates: The Capitol Volkssport Club invites walkers and cyclists to join them at Ocean Shores Saturday thru Monday of Presidents’ Day Weekend, February 16-18, 2019. Ocean Shores Oyhut Bay Area Walk 111020 – 5K or 10K or 15K (all rated 1A). Ocean Shores North Town Walk 111099 – 5K or 10K (both rated 1A). Damon Point Walk 111023 – 5K or 7K or 12K (all rated 1C). Moclips Walk 110986 – 5K or 10K (both rated 1C). Griffiths-Priday State Park Walk 111024 – 5K or 7K or 10K or 30K (all rated 2C). Seabrook Walk 111022 – 5K or 10K (both rated 2C). Point Brown Bike 111021 – 25K or 30K (both rated 1A). Two Ocean Shores YREs are also available 10K with 5K option (rated 1A or 1C). Driving Directions: I-5 Northbound and Southbound: Take Exit 104 (US 101). Continue westbound as US 101 becomes SR 8 and then US 12 and finally US 101 again, passing through Aberdeen and Hoquiam. From Hoquiam continue on State Route 109 approximately 18 miles to the intersection with State Route 115, and turn left. Continue to Point Brown Ave (the entrance to Ocean Shores) and turn left. Turn right onto Chance-a-la-Mer at the traffic circle, then take the next right which is Ocean Shores Blvd. Drive .1 mile to the Ocean Shores Lions Club on the right. Starting Point: Ocean Shores Lions Club, located at 832 Ocean Shores Blvd NW in Ocean Shores, WA. Start/Finish Times: Walkers may begin walking any time between 8 AM and 2 PM on Saturday or Sunday, and must be finished by 5 PM. Walkers may begin walking any time between 8 AM and noon on Monday, and must be finished by 3 PM on Monday. Saturday Evening Social: This is an Italian dinner at 6 PM on Saturday night, featuring a new caterer. See registration form for menu. We’re also excited to welcome the six-piece Burren Band, who will play Irish music. Cost is $35 per person (US Funds only, please), which includes tax and gratuity. B.Y.O.B. Advance reservation is required, and seating is limited to the first 120 tickets sold. Dinner reservations may be made via mail using the form located here, and must be received by February 1, 2019. Online dinner reservations via PayPal will be available by August 1, 2018, at which time the URL will be provided here. No tickets will be sold at the door. Further Saturday Night Social information: e-mail sheila.morrison@comcast.net. Facilities/Pets: Restrooms and water will be available at the start and finish, also at restaurants or stores (where they exist) along the routes. Pets are permitted but NOT in buildings. Owners must observe leash and clean up laws. Registration and Costs: These events count for American Volkssport Association (AVA) and IVV credit. Those walking or cycling for credit only will pay $3 per walk. Free participants are welcome. All walkers and cyclists must register, carry, and return a start card. Donations in support of the festival are always appreciated. Pre-registration for events is now open. Print and mail the form located here, or register online after August 1, 2018. On-site registration will also be available throughout the festival. Lodging: Please note this event occurs on a holiday weekend, so it would be prudent to make hotel reservations early. Other walks in the area: If you would like to come early, stay late, or walk on your way down and back, we have YREs for you. 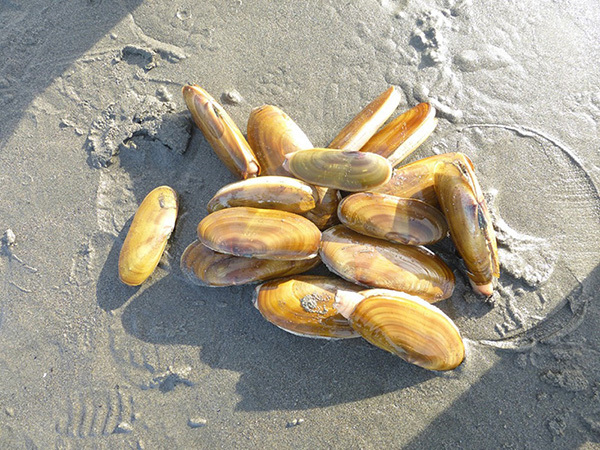 These can be found in Ocean Shores, Aberdeen, Centralia, Chehalis, Lacey, Olympia, Tenino, Tumwater, and Westport. Details of all of the YRE walks can be found here and details for YRE bikes here. Please note: The sponsors are not liable for accidents, thefts, or material damage. Every effort will be made by the sponsors to make this a safe, enjoyable, and memorable event. Weather will be provided; hope to see you there! Walk and bike details: All walks, and the bike route, are MAP ONLY routes; there will be no trail markings. Please also note that many of the walks are weather and tide dependent. The following descriptions are subject to change, as the exact routes have not yet been finalized. Ocean Shores Oyhut Bay Area Walk: 5K or 10K or 15K, all rated 1A. Walk the southern end of Ocean Shores through neighborhoods and city parks, and a new small development with café and Bistro, Market. Views of North Bay, Chehalis River and mountains.These walks are suitable for strollers or wheelchairs. Ocean Shores North Town Walk: 5K or 10K, both rated 1A. Take a break from the beach! Enjoy the north end of Ocean Shores with this walk. Walk past homes with views of North Bay as well as a small lake. After walking through neighborhoods you will wind your way along both sides of Point Brown Avenue NE where you can stop and enjoy a variety of shops, art stores, and a wide variety of restaurants. Damon Point Walk: 5K or 7K or 12K, all rated 1C. Walk around a former island in the Chehalis River, now connected to the mainland by a sand spit. On good days, there are views of the Pacific Ocean, Mount Rainier, the Olympics, and the distant cities of Aberdeen, Hoquiam, and Westport. Seals, eagles, sandpipers, sanderlings, surfers, fishermen, ships, driftwood, shells, and the occasional Snowy Owl are sometimes seen while walking in this area. On the ocean side of Damon Point, the beach can be quite steep; some walkers have found walking sticks helpful (one can easily be found among the driftwood, if you don’t normally carry one …). These walks are not suitable for strollers or wheelchairs. Moclips Walk: 5K or 10K, both rated 1C. Walk from Moclips to Pacific Beach State Park along the rugged north beach. This walk has the option of returning to Moclips through Pacific Beach State Park and the quaint town of Pacific Beach or along the beach. These walks are not suitable for strollers or wheelchairs. Griffiths-Priday State Park Walk: 5K or 7K or 10K or 30K, all rated 2C. 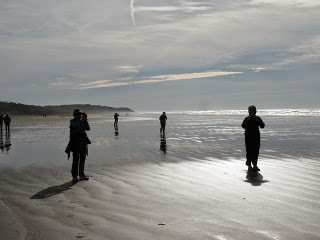 Walk through the dunes on a remote corner of the Washington coast, free from cars year-round, and along the beach. See nature in action as the land and paths erode in one area and build up in another. Due to this ongoing erosion, the path can be rougher than you might expect it to be walking on sand dunes or on the beach. Walking sticks are recommended for those who find them helpful. These walks are not suitable for strollers or wheelchairs. Seabrook Walk: 5K or 10K, both rated 2C. Walk through the new vacation community of Seabrook. This walk includes paved streets in the town portion, a trail through the woods surrounding the town, and the beach. Trails through the woods are fairly well maintained, but can be uneven. The 10K walk goes up and down the bluff via steps to the beach, and passes several huge tree stumps that were left by loggers in the past. These walks are not suitable for strollers or wheelchairs. Ocean Shores Bike: 25K or 30K, both rated 1A. The 25K and 30K routes circle the Ocean Shores peninsula on flat roads, through neighborhoods and undeveloped areas. Bikes are available for rent from local businesses. The Alliance formed in 2007 and launched the CoastSavers program to coordinate the efforts of volunteer groups and individuals that had been cleaning up Washington’s Pacific Coast since as far back as 1971. Our signature annual event is the Washington Coast Cleanup, which started as a series of separate beach cleanups held every April in celebration of Earth Day. The number of volunteers and the amount of debris collected keep growing. On average, over 1,300 volunteers participate in the cleanup and remove more than 34,000 pounds of debris each April. Awesome! Prior to 2007, our history has three branches: the Olympic Coast Cleanup founded by Jan Klippert; the three annual Long Beach cleanups organized by the Grass Roots Garbage Gang; and Operation Shore Patrol organized by the Pacific Northwest Four Wheel Drive Association. In April 2000, Seattle environmentalist Jan Klippert founded the Olympic Coast Cleanup as an Earth Day activity to clean up our northern coast, especially the hard-to-reach wilderness beaches. With the help of Olympic National Park, Olympic Coast National Marine Sanctuary, Surfrider Foundation, and several tribal groups, Jan’s efforts have blossomed into the current Washington Coast Cleanup. Also around 2000, a group of civic-minded folks down in Long Beach came together as the Grass Roots Garbage Gang to clean up their community beaches. With the help of Washington State Parks, the Gang holds three cleanups every year, including a January effort to gather winter storm debris, the April Washington Coast Cleanup, and a July 5 effort to clean up the “war zone” fallout of Independence Day fireworks. Cleaning our coast since 1971, the Pacific Northwest Four Wheelers have been at it longer than anyone! With help from Washington State Parks, Washington Department of Ecology, and the Ocean Conservancy, their Operation Shore Patrol event has become an annual tradition on Washington’s southern beaches. 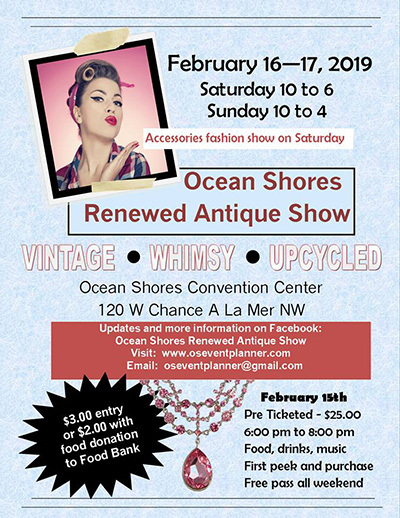 Ocean Shores Renewed Antique Show returns Saturday and Sunday, February 16-17 to the Ocean Shores Convention Center. Kicking off the weekend is a “Peek and Purchase” premier social event Friday, Feb. 15. Shop at the vendor booths inside the convention center. You'll be able to enjoy an adult beverage with nibbles. Live music with Sunni and KC of Unexpected Soul will be featured. Purchase a ticket allowing you to experience the weekend's show. the annual event opens to the public 10 pm-6 pm, Saturday and 10 am-4 pm, Sunday. Highlights include a vintage accessories show at 1 p.m. Saturday on the main stage. The antique show features over 50 vendors with a wide variety of antiques, collectibles, upcycled and repurposed items. Admission to the show is $3 or $2 with a non-perishable food donation for the Ocean Shores Food Bank. Friday night is 6-8 pm and a pre-ticketed function for $25. Free pass provided for the weekend. QCED (Quartet Champions of Evergreen District) is coming to Ocean Shores! After many years of traveling to Seaside Oregon, QCED will perform in Ocean Shores. QCED is a fraternity of past quartet champions from the Evergreen District of the Barbershop Harmony Society. The Evergreen District encompasses Alaska, Idaho, Montana, Oregon, and Washington; as well as the Canadian provinces of Alberta and British Columbia. Annually, the District holds a competition among its quartets and those who win the District Championship are inducted into QCED. QCED also hosts two shows a year, one in January and one at the District Convention. The proceeds are used to support coaching opportunities for quartets in out-lying areas around the District and assist our quartets who will be singing at the BHS International competition. give financial assistance to quartets representing the District in International Competition. For over ten years the group grew slowly. Finally it became apparent the Lopez Island location was too remote to guarantee attendace by many of the former champs, nor could sustain a good-sized audience at shows. In 1985, through the untiring efforts of the late Bob Swanson, the annual QCED meeting and show was moved to Seaside, OR as a joint venture with the Seaside Chamber of Commerce. With the great oceanside atmosphere, shops and restaurants, the new location was an instant success with QCEDers, their families, and fans alike. After 40 years of existence QCED has given tens of thousands of dollars to the promotion and betterment of our unique style of four-part harmony. The concert is 7:30 pm, Saturday, February 23 at Ocean Shores Convention Center. Tickets are $20, $10 for under 12 years old. Chocolate on the Beach Festival offers 13 miles of chocolate! Find vendors Saturday and Sunday at Pacific Beach Elementary School. Up and down SR-109, you'll find all kinds of chocolate delight. Returning to the schedule is an annual Sunday favorite. 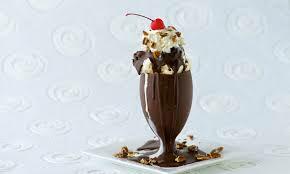 Chocolate Sundaes on Sunday is a sweet treat hosted by St. John's Chapel by the Sea. Create your own sundae with ice cream and toppings provided for you. This FREE event follows 10:30 am worship and is open to everyone. You'll find all kinds of toppings and ice cream. Pile it up in your bowl and choose how much chocolate to add and enhance. For the first time, this event will benefit the Barbara Topete Memorial Benevolence Fund. As a charter mamber, Barbara Topete (matriarch of Ocean Crest Resort) saw the need in the community through this fund which is designed to help those in emergency need in the North Beach. Whether it's a fire, accident, medical emergency, this fund gives back to those who have emergency circumstance thrust upon them. This is a FREE event. Any financial donations benefit this fund. St. John's Chapel by the Sea Presbyterian Church (PCUSA) is at 4612 SR 109, border of Moclips and Pacific Beach. For more information, please call 360.276.4183. Our small coastal community of Pacific Beach has been the home of the Chocolate on the Beach Festival for over eleven years now. In 2008, it started out as a small fundraiser for The Museum of the North Beach. In 2012 we became our own entity that has now grown into a HUGE event for the sister communities of Moclips, Aloha, Copalis Crossing, Seabrook, Copalis Beach and Ocean City and is now a four day event and over 13 miles long! The Chocolate on the Beach Festival supports organizations and groups in the North Beach area with grants and donations for historical, educational and community projects. This year, $6,000.00 in grant funds and auction baskets were given, making a grand total of over $41,000 donated back to our community since we became our own entity seven years ago! This is a fun, family festival offering something for every chocolate lover! There are chocolate vendors, artists, and crafters. You can attend a cooking class or enter your favorite recipe in the recipe contest. 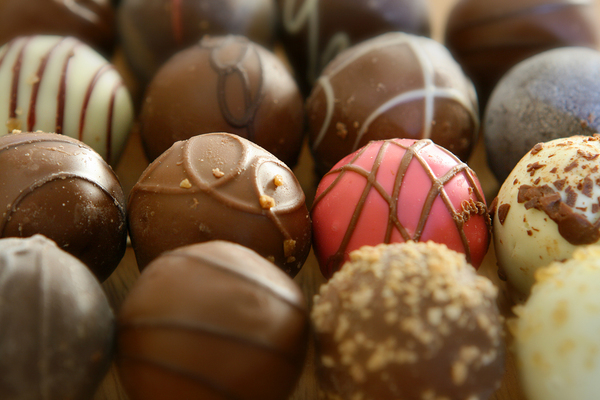 How about entering a chocolate eating contest? You can do all this and so much more. Attendees will find chocolate that is gluten free, dairy free, vegan, organic, fair trade, and even chocolate-themed crafts! Become a fan on Facebook by navigating to: https://www.facebook.com/ChocolateontheBeachFestival. There you’ll be able to chat with The Chocolate Lady, get recipes, and keep up to date on all things Chocolate Festival. The first weekend in February, 2019, Galway Bay Irish Pub, Restaurant, & Gifts takes its celebration of Irish Music in a new direction to explore the Irish influence in Appalachian, Bluegrass, Cowboy, Country, and Cavalry music. Galway Bay Irish Pub, Restaurant, & Gifts is proud to present its Appalachian, Bluegrass, Cowboy, Country, and Cavalry Music Festival (known as ABC3). The festival is Friday-Sunday, February 1-3. This festival will highlight a diverse mix of Appalachian, Bluegrass, Cowboy, Country, and Cavalry artists during this 3-day event, taking place exclusively at Galway Bay Irish Pub, Restaurant, & Gifts and 8th Street Ale House. The artist lineup headliners include Sea Star, the Olson Brothers Band, Caleb & Walter, and Carter Junction. Come on down and join us for a great time and great music! This festival is for anyone 21 or older. We hope to see you there! Teens grade 7-12 are invited to come, hang out, watch holiday films, and enjoy festive snacks and drinks in a safe, comfortable environment. Bring your beads and your creativity and join us as we learn new techniques and create beautiful beaded jewelry. Thursday: Brick Builders A program intended to encourage kids imaginations. Have fun building all sorts of things with those colorful plastic bricks that everyone loves. All local North Beach children are invited to come and make fun holiday crafts, write letters to Santa, and get their free wrapped book from the Elves. 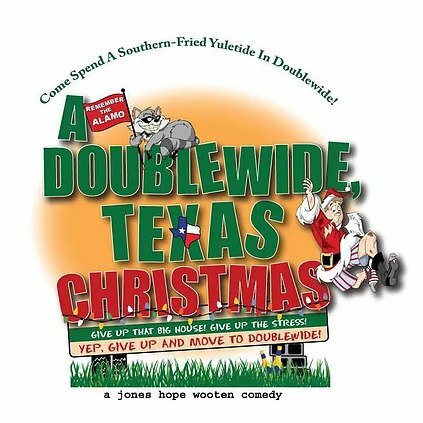 In this hilarious, fast-paced comedy, "Double Wide Texas Christmas," inhabitants of one of the smaller trailer parks in Texas - four doublewides and a shed - are thrown for a loop after realizing the nearby town of Tugaloo is determined to annex their park. And they're already dealing with plenty. Joveeta Crumpler has had it up to here, having been passed over again for a promotion at work. On top of this, she has an ongoing battle keeping her feisty mother, Caprice, out of the local bar. She also worries her good-ol'-boy brother, Baby Crumpler, is taking his participation in a womanless beauty pageant way too seriously. Her big-hearted best friend, Georgia Dean Rudd, is struggling to keep her diner and finances afloat and just can't curb her impulse to take in every stray cat, possum and armadillo that wanders by. Then there's Big Ethel Satterwhite, who's nobody's fool. But tough as she is, she's continually frustrated by her clients at Stairway To Heaven Retirement Village as well as her mule-headed husband, O.C., who shows far more affection for his Barcalounger than he does for Big Ethel. And all the residents are plagued by Haywood Sloggett, the curmudgeon from across the road, who loathes their 'trailer-trash' ways, especially their keeping a life-size illuminated nativity scene up year 'round. But these friends, enemies and neighbors realize they'll have to work together to defeat the encroaching annexation if they - and their way of life - have a snowball's chance to survive being swallowed up by 'the big guys.' The rollicking mayhem of this flat-out funny Jones Hope Wooten comedy escalates as the residents attempt to secede from Texas, discover a traitor in their midst and turn the tables in a surprising and side-splitting finale. So grab your Stetson and come on over to Doublewide, Texas, where life is double the fun, double the joy, and where audiences double over with laughter! It's the latest production of Stage West. Show times are 7 pm, Fridays and Saturdays, November 30, December 1, 7 and 8. 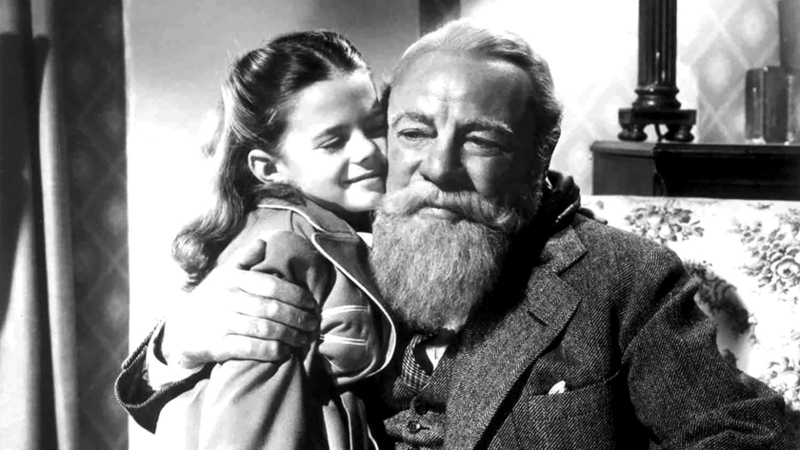 Sunday matinees are 2 pm December 2 and December 9. The productions are at Ocean Shores Lions Club. Tickets are $10, available at Ocean Shores Convention Center, Dolores' and Fay's, and Mocha Madness. 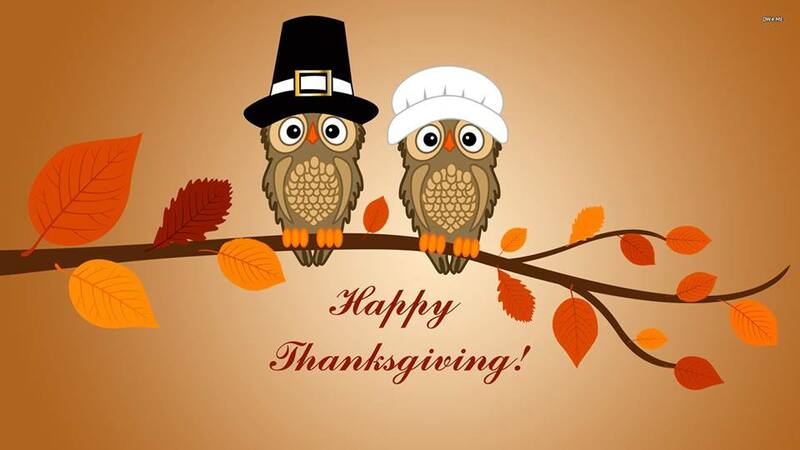 Ocean Shores Lions Club again hosts the Free Thanksgiving Dinner. It's the sixth year for this tradition served 1-4 pm, Thursday, November 22. Volunteers serve over 300 with a dinner including turkey, ham, mashed potatoes with gravy, yams, green beans and rolls. Save room for dessert. Donations come from Ocean Shores IGA, North Beach Senior Center, Ocean Shores VFW Post 8956, Quinault Beach Resort & Casino, Church of Latter-Day Saints ane more. Lions Club hosts the event at 832 Ocean Shores Blvd. This gives everyone more than a meal. It's a get-together where you may chat with the attendees and volunteers. You may even get a box of leftovers to go home with you. There is free delivery for those requesting. Please call Ernie and Leona Nelson at 360.289.2314 so it may be arranged.